China, it now seems, has entered into a real slump. There were plenty of leading indicators. I should have given more weight, for example, to the slowdown in European exports to China over the course of 2018. China's total imports remained pretty strong though until the last couple of months. But they have now turned down. Sharply. In a deep sense, China’s slowdown shouldn’t be a surprise. China tightened last year. Goldman's Asia team had a useful chart in an early January paper showing a sharp consolidation in the “augmented fiscal deficit”—and it looks like China’s efforts to slow the growth of shadow banking and introduce a bit of market discipline into lending have curbed the flow of credit to private firms (see Nathaniel Taplin of the WSJ). And China has a history of tightening too much, and slowing an economy that still structurally relies on credit to generate internal demand (the flip side of high savings) whenever it tries to wean the economy off bank and shadow bank lending. Look at the weakness in Chinese imports in the chart above in late 2014 and most of 2015. That’s the last “tightening” cycle. 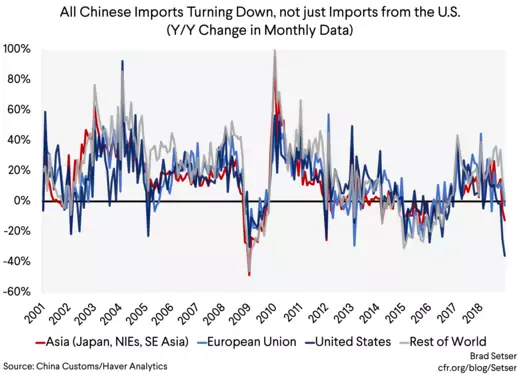 But the extent of the current slowdown is now increasingly clear in a broad set of data, both data from China and data from China’s trading partners. And that raises the question of how a Chinese slowdown impacts the world. There is a bit of good news here—China (still) isn’t that important a market for the rest of the world’s manufactures. China’s overall imports (of goods) are significant, at around $2 trillion. But about a third are commodities, about a third are parts for re-export (think $800 billion of processing imports vs. exports of around $2.4 trillion), and a bit less than a third are imports of manufactures that China actually uses at home. And that means that China matters far less for global demand for manufactures than say the United States. China’s imports of manufactures for its own use (net of processing imports) are roughly a third of U.S. imports of manufactures. Actually a bit less than a third. The United States doesn’t break down its imports for re-export, but U.S. exports of manufactures are so low—only around 5 percent of U.S. GDP—that imports for re-export can largely be set aside. The imported content of U.S. exports is still—per the OECD—relatively low. 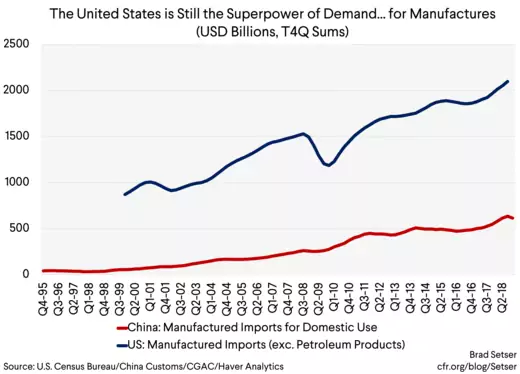 Bottom line: when it comes to supplying the rest of the world with demand for their manufactures, the United States is still in a league of its own. China remains in the second division. That doesn’t mean Chinese import demand doesn’t matter at all—$600 billion in imports is real money. 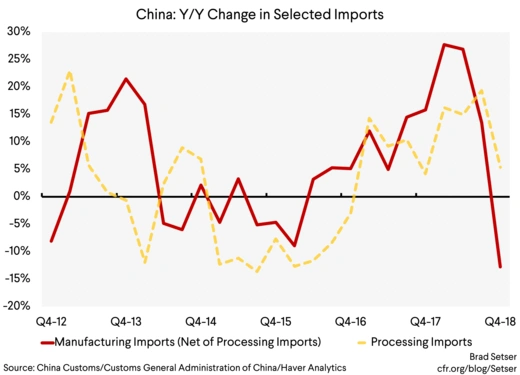 When China’s imports were rising quite strongly in late 2017 and early 2018 that provided a bit of help to regions around the world with slow demand growth and weak currencies. I am, of course, thinking of Europe in general, and Germany in particular. 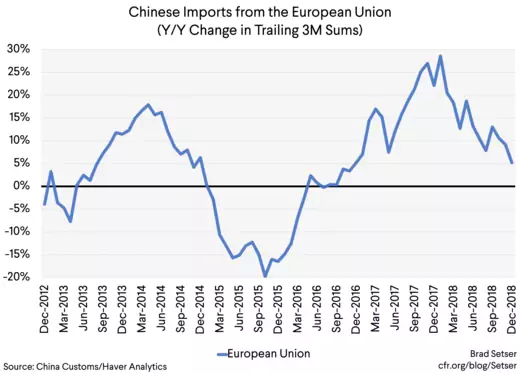 Europe’s share of the $150 billion rise in China’s manufactured imports (net of processing) from end 2016 to mid-2018 was something like €30 billion—enough to matter. But on the manufacturing side, China's largest impact on the rest of the world continues to stem from its export machine. 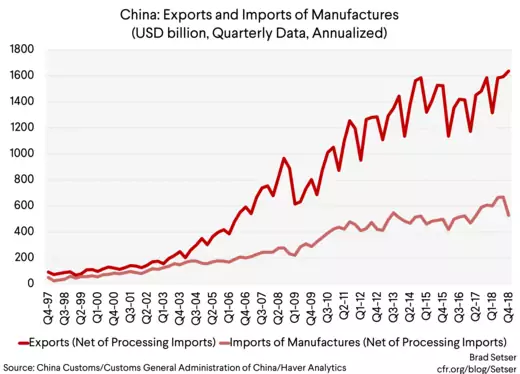 China’s exports of manufactures, net of processing, are roughly two and a half times bigger than its imports of manufactures, also net of the processing trade—think $1500 billion vs. $600 billion (for 2018). That’s why the recent stability of China’s currency matters. For now (and of course things could change) China isn’t trying to offset domestic weakness through depreciation and a weaker currency. A 10 percent fall in China’s imports is a much smaller shock to global demand than a depreciation that reallocates global demand toward China and raises China’s exports by 10 percent. It is an inadvertent benefit, perhaps, from the trade truce, and Trump’s apparent willingness to cut a deal, almost any deal, to restart soybean exports and avoid a new round of tariff escalation. Current energy pricing reflects the confluence of expectations of strong U.S. supply growth (in the face of significant reductions in Venezuelan and Iranian exports) as pipelines connect West Texas to the Gulf of Mexico—and weaker demand growth out of China. A fall in Chinese auto demand has a big impact on Chinese domestic output (most Chinese cars are made in China, with largely Chinese parts, thanks to China’s tariff wall), a measurable impact on the profits of some foreign firms with successful Chinese JVs, a modest impact on German exports and, at the margin, a measurable impact on global growth in oil demand. China matters for the entire world, no doubt. But its impact on the world isn’t totally symmetric. * UBS recently argued that the net fiscal stimulus would be between 1.5 and 2 percent of GDP in 2019—with roughly 1.5 percentage points of GDP in central tax cuts offset in part by central government spending cuts of around 1 percentage point of GDP, and a roughly 1.5 percentage points of GDP fiscal loosening at the local level to support increased infrastructure investment. I of course would prefer a somewhat different kind of fiscal stimulus, one less focused on pro-business tax cuts and one more focused on raising low levels of social benefits and reducing the relatively large social contributions paid by some workers. ** I left services—a poorly measured category often heavily influenced by trade in tax that gets inordinate attention because of the widespread perception that it is the United States’ comparative advantage—for a footnote. But that’s more or less right for China. Its imports of tourism services (vacations) are significant (around $300 billion in 2018), though poorly measured. But they certainly matter for some individual countries that have been at the center of the tourism trade, most notably Thailand. China's imports of other services are still trivial. And China isn’t (yet) a big services exporter. The impact of a slowdown in China on global demand for non-travel related services can largely be ignored. Many articles highlighting the great potential services offer for the United States blur the line between actual trade in services and the ability of a foreign firm to provide services in China if it establishes in China (an important distinction in my view; U.S. firms setting up shop in China to provide services inside don't support many jobs back in the United States).